- Heating by means of external platens and pads placed inside the tire. - Bult-in controllers with automatic regulation of temperature, time and pressure. - Interchangeable aluminium moulds for a perfect adjustment of the tire and to avoid deformation. - Repairs damages on shoulder, sidewall, tread and bead. - Mobile cradle for an easy handling of the tire. Weights and dimensions do not include molds and accessories. Steel made press. 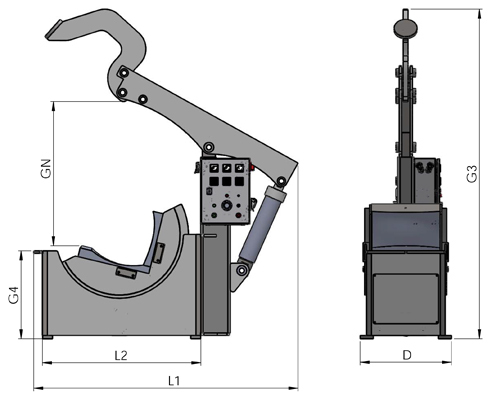 It is composed by frame, weighting arm, heating platens, pneumatic cylinder and control display. Easy programming. Automatic control of the whole vulcanization process once melting temperature and dwell time have been set. Includes pressure regulator, manometer, thermometers and timer. Uniform pressure by means of hydraulic cylinder. Fast heating of the platens that transfer the heat to the aluminium moulds. Thanks to the mobile cradle, pressure is applied perpendicular to the reference plane of the damage to repair, depending on where it is: shoulder, sidewall or tread. Made in silicone, it provides heat from the inner tire section to be cured. Made of fireproof and resistant fabric, it is used to consistently spread out the pressure on the area of the tire to repair.